Sealcoating your Orlando parking lot will enhance its lifespan, ultimately saving you money on repairs. Every Orlando parking lot should be sealcoated. A sealcoat is an important layer of protection that extends the parking lot’s useful life, enhances its color, and makes visitors feel that much more welcome. Paving professionals should sealcoat your Orlando parking lot to eliminate all of those annoying surface voids to minimize contact with the sun’s ultraviolet rays and oxygen. This is the protective shielding your lot needs to prove functional and visually pleasing. A sealcoating reduces the level at which moisture, gas, oil, and other spills can move on down into the pavement. Preventing water from reaching the layers below the surface is essential to stopping the formation of potholes and cracks. The surface of your asphalt parking lot will eventually oxidize, turn grey, fade in appearance, and endure additional damage. Do not overlook the importance of this surface’s appearance. Your customers, employees, business partners, and guests will judge your organization as soon as they pull into your lot. Let professionals apply a fresh sealcoat to liven up the look of your pavement. Sealcoating adds color to your pavement, improving its look and empowering it to withstand wear just like a brand new surface. The temperature of the air and pavement for a sealcoat application should be a minimum of 55 degrees. The temperature must remain in this range for the eight hours following the application. The surface will be cleaned of all debris and dirt before the pavement can be sealed. 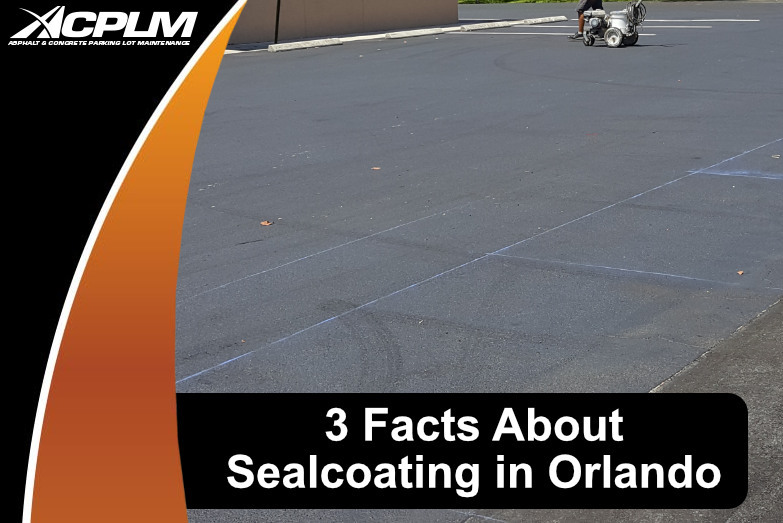 Sealcoating in Orlando does not take long, yet it is important to prevent traffic from traversing this surface for upwards of a day and a half. Let your newly-sealed parking lot dry and it will look far better than before. This is the economical and quick protective layer your parking lot needs to look and function its best for years to come. If you own or manage a business or other organization in the greater Orlando area that has a parking lot, let ACPLM perform a sealcoating to extend its life. We also provide parking lot maintenance, repair, and replacement services of other varieties. Contact us at to learn more about our sealcoating services in Orlando and schedule an initial consultation.